This version of the distribution maps has a number of map options which are described below. A simpler version without some of these options is also available, and it has been designed for use with phones (though it can also be used on a computer). To show a species map, choose Scientific or Common names, then key in at least 3 characters of the name in the top box and press the [Enter] key or click on the "Find matches" button. Nomenclature and ordering follows the Checklist of the Lepidoptera of the British Isles (Agassiz, Beavan and Heckford, 2013, with subsequent additions and amendments) and only scientific names are used for most of the micros. If there is a unique match for the partial name, the appropriate map is displayed. If there are more matches, the first is displayed and you can select any of the matching names from the resulting list in the name selection box below the year period selector. Any part of the name can be used, so for example selecting common names and entering "tig" gives a list of the Tiger moths. Alternatively you can enter either the ABH Checklist number or the 2000 Bradley Checklist number instead of part of the species name. You can choose to search on larval food (again by entering at least 3 characters). This will only find those species for which the food you enter is listed explicitly below the species map. There may be other matching species for which the food is not listed, e.g. those which use many foods including that one. You can use the species slider bar above the map to move forwards and backwards through mapped species in Checklist order. Click on the [<<] or [>>] button to move backwards or forwards by one species. Alternatively in some browsers you can use the mouse wheel to scroll through the full set of species maps when the cursor is over the graphics area, or if you scroll the wheel with a [Ctrl] key pressed, it has the same effect as a left or right mouse click as described below. The initial map shows the numbers of species recorded for each tetrad (2Km square) as one of 8 ranges. This map precedes the first species map when using the slider bar, movement buttons or mouse wheel. To see the total number of moth species mapped for a tetrad, move the cursor over that tetrad on the map. Numbers of micro and macro moth species are shown in brackets. With the cursor positioned over a tetrad on the map, you can use mouse clicks to move backwards and forwards through the maps of species recorded from that tetrad and years period, or alternatively through the maps of species not recorded there but recorded in the chosen number of adjacent squares (1 - 8) during the selected period. You can restrict this information and movement (and also the species density map) to rare & scarce species or locally scarce species, and/or to just micros or macros, by selecting the checkboxes. As usual moths in the families Hepialidae, Cossidae, Sesiidae, Limacodidae and Zygaenidae are treated as macros. Locally scarce species are selected by specifying the maximum number of tetrads (from 1 - 10) from which they have been recorded during the selected years period. If you want to compare tetrad maps for two species (or more), or to compare the other types of display, you can use the preset buttons. These are updated automatically as you display different species. To cycle through several species for comparison purposes, select each species in turn then repeatedly click on the lowest button for one of these species. Each time you do this the chosen species is moved back to the top button and the others are shifted down by one position so that you always click the same button to see the next species in the comparison group. Alternatively, you can view three tetrad maps simultaneously on the Wider Glos. moth maps page showing previous species maps at half size. A solid dot on a map indicates that the species was recorded in that tetrad (2Km x 2Km square) since 2000. The solid blue dots show records from 2010-2017, and red dots show the records from 2018. A hollow grey dot indicates that the most recent record held for the tetrad is pre-2000. You can choose to display the distribution for any of 9 periods: all years, pre-2018, pre-2010, pre-2000, 2000-2009, 2010-2017, 2018, 2010-2018 or 2000-2018. To change this you can use the drop-down list in the period selection choice box, and in some browsers you can also use the mouse wheel when the cursor is over this box. The year chart is based on all records whichever distribution is displayed. The same period options are available for the initial species density map. If you have any colour blindness and find that some of the five dot colours used on the various displays are difficult to tell apart, you can select alternative colours which you can save to a cookie so that they are used automatically in future, if your browser settings allow this. Click the [Settings] button to open the colour selection panel which contains instructions. You can set a 'home tetrad' which will be highlit on the maps, and also used by the optional voice output to report on when each selected species was last recorded in that tetrad. You can set/change/cancel home tetrad with/without voice reports by clicking over a new tetrad with [Shift] or [Ctrl] pressed to set it ([Ctrl] for voice reports), or over the current home tetrad to cancel it. You do not need to open the Settings panel to do this, but you do need to use the panel if you want to save any changes to the settings cookie. If you save your chosen settings to a cookie it will expire after 100 days and it is not renewed automatically, but you can save your changes at any time to reset the expiry date. If you try to save the settings but the colours are not shown in the 'Saved' column, your browser did not save and check the cookie successfully. The year chart above the map shows relative numbers of records in 3 date periods per month (1st - 10th, 11th - 20th, and 21st - end). Solid black bars indicate records of adults, open orange bars indicate non-adult records: eggs, larvae, pupae, larval or pupal cases, distinctive feeding signs such as leaf mines etc. Open grey bars indicate unspecified/unavailable record type. Position the mouse pointer over a period in the chart to see the numbers of records for that period. As indicated on the screen, you can then use mouse clicks to scroll through the species recorded during that period in order by total number of records (from all years, regardless of map display period). Note: because each type of bar has a minimum height for visibility, a few records of each type can result in a taller combined bar than a lot of records of one type only. For those species which have them, these options include the unconfirmed records. For the species density map, these options are ignored except for the date period which results in a chart showing for each year since 1990 the year's total number of species increasing throughout the year; move the mouse pointer over a year to select and highlight its graph, then over a period column to see its species total. Note that these totals are derived only from records supplied with full dates and shown on species year period charts, so the late December values are slightly lower than the actual year totals in some cases. To the right of a species map small dots indicate the years starting from 1980 for which records are held in the database (which could include some not mappable to tetrad) for VC34 (West Gloucestershire), VC33 (East Gloucestershire) and for the small parts of present-day Gloucestershire & South Gloucestershire in other VCs. The map axis labels indicate the year, e.g. the dot just above the 10 grid line indicates 2010. Position the mouse pointer over the VC33 or VC34 column to see that VC's species totals for a year, or between the VC34 column and the map axis to see the totals for the whole recording area. For species with blank maps or no tetrad dots before 2011, a comment box on the map usually indicates reports mentioned in the previous Glos. County Moth Recorder Roger Gaunt's 2006 publication "Gloucestershire Moths - A Second Account". U-shaped dots are shown on the tetrad maps for some species, with explanatory comments shown on the map. In most cases they show records now considered to be unconfirmed, though not necessarily doubtful. For some pairs or small groups of similar-looking species, all records are shown as U-shaped dots unless they are confirmed by some additional evidence such as dissection, distinctive larva or larval food, etc. Some comments for macromoths indicate other species in square brackets. These are some of the most likely pairs or groups of species for which mapped records of adults identified from markings without additional confirmation (usually by dissection) probably include some mistakes. Numerous micromoth species can only be identified with certainty by dissection. Records of species forms/subspecies originally given separate Bradley numbers have been included with the main species entry. Comments are added to both maps where a pair of species was recently treated as a single species. The typical UK larval food information is derived from several sources, and is probably incomplete &/or inaccurate for a number of species. UK national status data listed here may not be completely accurate, and for some macro-moth species it is known to be out of date: some have become more widespread and others have become much scarcer since species were assigned to the various categories. The status of micro-moths was updated in January 2012 in Butterfly Conservation Report No. S12-02. The abbreviations used here are explained in the table below. If selected, the rare & scarce species option includes the categories from RDB1 down to Nb. In square brackets after the species status, the microlepidoptera verification gradings issued by Butterfly Conservation in early 2016 are given. These consist of gradings for identification of adults (except for many of the Nepticulidae which are considered too similar in appearance), for larval cases of those species which construct them, or for leaf mines of those species which make them. The gradings below are copied from the Guidance document on the Moths Count website, which contains additional guidance. The species gradings shown on the maps are copied from the Spreadsheet on the Moths Count website which also contains comments on some species which in some cases limit the applicability of the grading. For species with comments, the + character follows the grading(s) and the comment is shown below the map. In square brackets after the species status, an indication of the macrolepidoptera recording criteria for VC33 issued by Robert Homan in 2014 is given in a similar format to the microlepidoptera guidance. These indicate the details that should be provided to support a record of the relevant species. A photograph in this instance should mimic the view of the moth given in a field guide i.e. in most cases the camera should look straight down on the moth, using a neutral pale background and there should also be an indication of scale. Photographs should be taken in natural light as flash can give a false impression of colour. Please avoid pictures of moths taken in egg boxes - these can distort the impression of size and shape and it is difficult to get a correct balance of light across the subject. Some species cannot be accurately identified unless they are dissected hence the request to retain the specimen. In such cases recorders are welcome to do their own dissecting, but please provide a microscope picture of the results. Particular care should be taken with records of any species with no grading. A photograph might be sufficient to support a new Vice County record, but please retain the specimen until the record has been verified. Pugs collectively are difficult! Several species have common melanic forms and all of them seem to be especially prone to wear. If there is any doubt then either do not record or retain the specimen for dissection. The VC33 gradings are shown below. For species with a more detailed comment in the criteria, the + character follows the grading(s) and the comment is shown below the map. Please note that there is currently no similar grading list for VC34, and that because of their habitat requirements some species are much less likely to be found in one of the two vice-counties than the other, as indicated on the map. For these species at least, the evidence required for a VC34 record might be different than for VC33, either more or less. For the small areas of present-day Gloucestershire which are in other adjacent Watsonian vice-counties, records should ideally be sent directly to the appropriate vice-county recorder rather than one of the above three Glos. recorders. An up-to-date list of recorders can be seen via the BC County Moth Recorders page. Any records received by the Glos. recorders for these areas are shown on the maps. The map shows the recording area: the counties of Gloucestershire and South Gloucestershire, together with those parts of Watsonian vice-counties VC33 (East Glos.) and VC34 (West Glos.) which are outside the current administrative counties. The VC boundaries are shown in green, and where different the Glos. and South Glos. boundaries are coloured cyan. Rivers and coastlines are shown in blue, and within the recording area land over 175 metres in altitude is shaded. 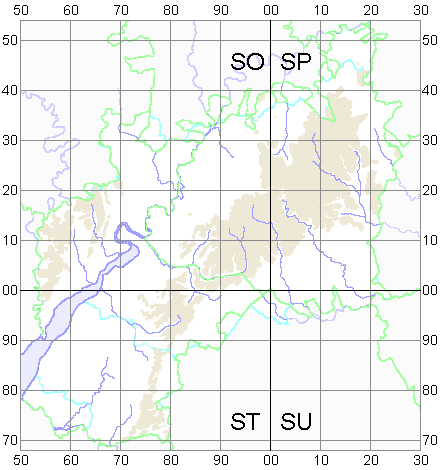 Ordnance Survey 10Km grid lines and 100Km square letters are shown. The Botanical Society of the British Isles has a web page showing the VC areas and providing a form to give the VC number when you input a grid reference, at http://herbariaunited.org/gridrefVC/. The Gloucestershire Centre for Environmental Records grid reference page at http://www.gcer.co.uk/doublemap3.html can display selected VC boundaries over a zoomable map or satellite view. The VC33 & 34 boundaries are available in the form of simulated GPS track files, for display on the map page of a GPS. They can be downloaded from VC33_34_boundaries.html. Please note the OS Open Data Licence, and the disclaimer. Complete accuracy of the data is extremely unlikely - with more than 500,000 records some errors and omissions are inevitable. Records shown are those supplied to the VC33 & VC34 recorders indicated above, to the previous Gloucestershire moth recorder Roger Gaunt (to 2011), and VC34 records supplied to the Bristol Regional Environmental Records Centre (BRERC) to the year shown above. Some unconfirmed records and those with insufficient information for mapping purposes have been omitted. For tetrad dots on the area boundary, some records might have come from just outside the intended recording area. For pairs or groups of species not separable with certainty from wing markings, only those records identified to species have been shown but some of these could be erroneous.